Mark Your Calendars for the April #OHMuseumChat! The Ohio Museums Association is proud to present our April twitter chat – #OHMuseumChat– Thursday, April 18 at noon! These chats are a great, informal way to keep the communication flowing between museums in Ohio (and beyond)! Joining us will be special guest panelists and museum professionals from across the state! A twitter chat is a live event focused around a single conversation hashtag - in our case, #OHMuseumChat. Our chat will use twitter as a means to connect museum professionals across Ohio (and perhaps, beyond!) for a relaxed and informal discussion on whatever our monthly topic is - which, for April is "Creative Ways to Engage New Visitors." All you need to do to participate in the #OHMuseumChat is log on to twitter by noon on Thursday, April 18 and search #OHMuseumChat. Then, you can join the conversation by adding #OHMuseumChat to your tweets. It's that simple! As this month's chat is focused on new visitors, we encourage you to bring your questions and ideas! Take advantage of the expertise and experience of your peers, and learn more about this topic. Be sure to follow OMA on twitter - @OhioMuseums for all the latest updates from the Ohio Museums Association, and don't forget to follow #OHMuseumChat for the full April discussion as it happens. 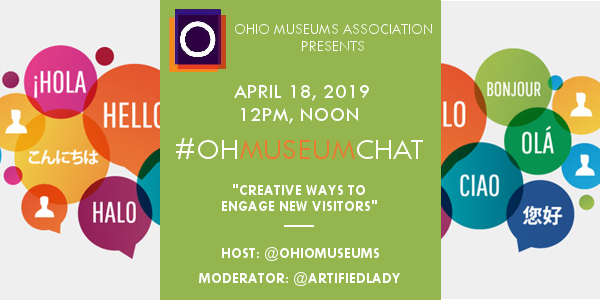 Bring your ideas, questions and best practices for a lively and inspiring conversation with colleagues from across the state to the #OHMuseumChat, Thursday, April 18 at noon! We hope you can join us!